The Goethe-Institut Namibia this week hosted a new year’s reception for their clientele as well as for the media. 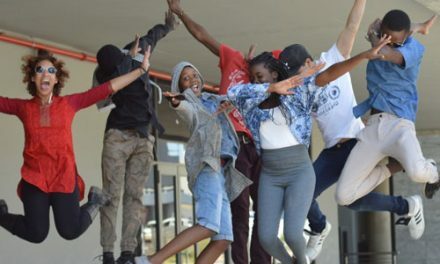 Director of the Goethe-Institut, Daniel Stoevesandt, said the mix and meet event was meant for interactive purposes as well as to introduce projects that the organization is going to roll out later this year. Stoevesandt said last year was a very successful year for them, with their three regular activities, filling up the Institut. “Many of you know our regular activities , such as the monthly Night Under The Stars concerts, which gives a platform for local musicians, or the micro-grants programme Goethe-Stage that enables upcoming artist to realise their own artistic expertise, and our exhibition hall is regular used by local photographers, painters and sculptures,” he explained. Looking at 2019 he said apart from their regular activities, there are some continuity and some new topics for them, with one of their biggest event being the continuation of the Museum Conversations that last year started on a small scale and was rather intimate in 7 countries. “It will be continued in September in Windhoek but this time on a regional level and we are very proud that this meeting of may experts from Africa and Europe will take place in Namibia, to create a great platform for further conception work around museums and their future role in a post colonial Africa,” he added. He said other training programmes will be implemented for the music industry, for upcoming curators and film makers, which will be exciting as all other projects they do but most importantly, will be targeting the young, creative and productive youth of Namibia for them to learn skills in particular discipline. “With these programmes, we ensure to go beyond showcasing and form a strategic partner of arts and creative industries in Namibia and I want to thank you all for coming tonight and look forward to fruitful conversations about our plans for this year,” he concluded.